When someone shows an interest in your opportunity, you feel hopeful for that nibble to become a catch. But you can’t fillet a nibble. This book will help you turn that nibble into a catch… and you can definitely fillet that! Gary reveals the tools he has used for decades to make millions of dollars in sales and how you can turn your own nibble into a catch. His step-by-step, no-nonsense approach will make a dramatic difference in how you approach your selling proposition and increase your sales. Get ready to take your business, income, and life to a whole new level. You ll learn how to create an incredible never-give-up attitude and understand psychologically why we have challenges with following through… and how to take massive action toward goals while being incredibly persistent. Most importantly, you ll have a blueprint to help you master the challenges that will bring you measurable results. It’s time for you to reel in more customers and turn your nibble into a catch, every time. How to get off the emotional roller coaster of being in sales. Use Gary’s mental exercises to handle rejection with ease. Learn Gary’s Marketing 101 Formula that will grow your sales to higher levels NOW. How to have the guts of a burglar to get through any gatekeeper. 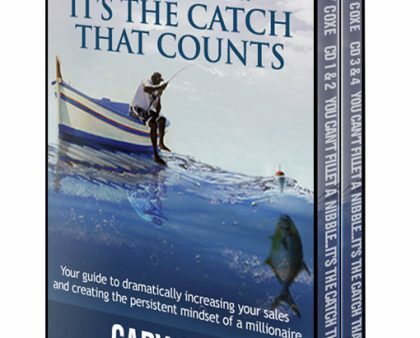 Learn Gary’s three-point blueprint system that makes you unstoppable and gets you taking massive action with all your leads to get that catch. Master the psychology of being massively persistent without will power. Why having too many leads can make you poorer. Know when to stop or keep contacting a potential customer. Learn how to disobey your self-talk.